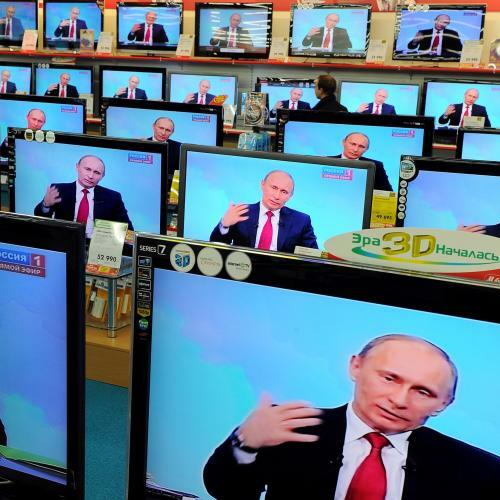 Why are liberals lending credibility to a zany Russian TV station? As international outcry grows alongside the body count in Syria, one news network has taken a decidedly unconventional approach to covering the crisis. Featuring a regular barrage of stories such as “Qatar Is Aligned With US in Destabilizing Syria,” “After Libya, ‘Syria Next Piece on Geopolitical Chessboard,’” and “West’s Policy on Syria Could Ignite WWIII,” the English-language news channel RT (formerly, Russia Today)—available via cable or satellite in tens of millions of American homes—has held to its steadfast view that civilian casualties in Syria are minimal, foreign intervention would be disastrous, and any humanitarian appeals from Western nations are a thin veil for a NATO-backed move to isolate Iran, China, and Russia. “President Obama is acting on a British geopolitical plan to force a confrontation with Russia and China, a military confrontation of which Syria and Iran would merely be the ignition point,” explained expert guest Lawrence Freeman, a Lyndon LaRouche devotee, in one typical segment. Of course, it isn’t remarkable that eccentrics like Freeman are willing to appear on the Kremlin-funded station. What is surprising, however, are the number of decidedly non-crazy American experts and journalists who appear regularly on the channel’s news programs as guest analysts. Indeed, whether it’s playing host to contributors from respected outlets like The Nation or Reason or the Center for American Progress, RT has excelled in cultivating American liberals and libertarians eager to criticize the United States for its adventurism abroad and sermonizing posture toward other nations. Between the outrage following allegations of fraud in Russia’s parliamentary elections last December and the country’s more recent veto of a U.N. Security Council resolution condemning Syria, it’s clear why RT would want Americans to supply a counter-narrative that makes the United States look out of line for lecturing Russia. The bigger mystery is why American journalists and academics continue to go along for the ride. RUSSIA TODAY WAS FOUNDED in 2005 on the heels of Vladimir Putin’s famous declaration that the collapse of the Soviet Union was “the greatest geopolitical catastrophe of the century.” From then on, as Julia Ioffe noted in Columbia Journalism Review, both the network and the regime came to embrace an ideology of “sovereign democracy,” a concept meant to promote Russian “independence of an externally imposed Western morality.” The network’s insistence that the United States is a bad-faith arbiter of global affairs can be seen as a direct extension of this philosophy. One of the main ways in which RT manages to persuade legitimate experts and journalists to appear as guests is by providing extensive airtime for issues that generally fail to register on other, larger news outlets. “I’ve been given the opportunity to talk about military expenditures in a way I haven’t been given in U.S. outlets,” explains John Feffer, codirector of Foreign Policy in Focus and a frequent critic of U.S. defense spending. “I have a basic policy in which I’ll be interviewed by anybody.” As for the fairness of RT, Feffer points out that he also talks to U.S.-funded news outlets like Voice of America and Radio Free Asia. “You’re going to find blind spots in the coverage for any news organization,” he told me. On the other side of the spectrum, RT devotes a disproportionate amount of time to covering Ron Paul, wondering aloud why the presidential candidate and his vision of the United States don’t get more attention from the mainstream media and running stories with headlines like “Corporatocracy: Ron Paul Says US ‘Slipping into Fascism,’” “Ron Paul: ‘Last Man Standing for Lost Liberties,’” and “Ron Paul, US ‘Fascist System’ More Like ‘Dictatorship’! ?” The network’s obsession with the erosion of U.S. civil liberties—“US Police Wage War on Cameras,” “CIA Won’t Disclose Involvement in OWS [Occupy Wall Street] Crackdowns,” and “Big Brother: Is the Red Squad Back in Chicago?”—attracts a number of libertarian journalists happy to have a platform to discuss their views. One issue where RT persistently tries to push just such a moral equivalence is on elections. Before the 2008 U.S. presidential election, RT interviewed Thom Hartmann, a progressive talk-radio host (who now has his own talk show on RT), and asked him whether he thought the upcoming elections would be fair. “No, it’s not going to be a fair election,” Hartmann responded emphatically. “The United States seems to like to be critical of other nations,” the RT reporter pressed. “Do you think at this point it is really in a position to criticize other countries and to lecture them?” “I don’t think that we’ve been in a position where we can afford to lecture other nations for a long, long time,” Hartmann replied. As to whether he has any qualms about voicing his views on RT, Escobar told me, “I knew the Kremlin involvement, but I said, why not use it? After a few months, I was very impressed by the American audience. There are dozens of thousands of viewers. A very simple story can get 20,000 hits on YouTube. The feedback was huge.” Indeed, RT is a major online success: Its YouTube videos have garnered more than 690 million views. Jesse Zwick is a special correspondent for The New Republic. This article appeared in the April 5, 2012 issue of the magazine.